I'm excited to announce that my fifth book in my Flurry the Bear series has gotten a professional editorial review by KIRKUS REVIEWS. See what they had to say about The Rising Tide. You may click on the image of the book to be taken directly to the review on Kirkus's website, or you may scroll down to read the review here. A courageous bear sails the high seas in this fifth installment of a children’s fantasy series. Back at home after his latest exploits, Flurry, the live teddy bear, is annoyed when his human mother admonishes him for stealing a pirate movie. Flurry goes to bed, only to wake up to discover that his room has been replaced by the ocean. Flurry and his four plush friends—Noah, Boaz, Honja, and Caboose—pilot their floating bed to shore, where they find themselves on the outskirts of Tigris, a city inhabited by walking, talking tigers. They quickly run into Flurry’s old friend Chingu and old frenemy Drizzle, who are in Tigris looking for Chingu’s brother, Shinyuu, who has been seized by pirates. The group manages to locate Shinyuu, but only after being abducted. They learn they are being taken to the dreaded pirate king Black Bear’d. “He’s the most ruthless and evil pirate there ever was,” another prisoner informs them. “He’s as ferocious at sea as any other grizzly bear would be on land.” A new mission emerges: rescue the captured Capt. White Cloud and keep Black Bear’d from building a secret army, whose vile purposes are more than those of the average pirate. 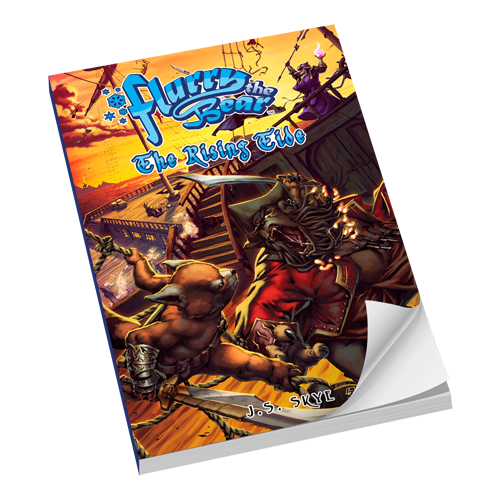 The biggest thing standing in their way is Black Bear’d’s powerful sorcerer, Theran—and, of course, Flurry’s penchant for letting his pride screw up the plans of his friends. Skye’s (Churchianity Pandemic, 2017, etc.) prose is direct and lively, conveying the excitement that Flurry feels through every step of the escapade. The book succeeds in evoking the unfettered imagination of youth: simple conflicts of good vs. evil, with plenty of cannons, sword fights, and swashbuckling. The author makes a minor nod to the trauma these recurring conflicts have on the protagonist—“Flurry’s parents managed to make an arrangement for him to get therapy over the phone, since it would not be possible to take a living, breathing teddy bear to the therapist’s office”—but in general this is adventure without consequence, experienced by a hero who is part animal, part toy, and part energetic boy who never wants to go to bed. A rousing pirate tale and a welcome addition to the Flurry series. I'll be back at GenCon again this year. I'll be in Author's Avenue, as expected. This year I'll be selling physical copies of books 1 - 6 in my series as well as e-book versions. My e-books will be ONLY $2! I have special convention prices for everything! I'll even have Flurry, in plush form, for those of you that love to hug and cuddle adorable little bears. I mean, who doesn't? I'm selling unique, limited edition art prints and giving away numerous freebies to anyone that visits the table. I'm also offering a free e-book to anyone that comes to Flurry's website and signs up for Flurry's mailing list. Lot's of fun and excitement to be had. I hope to see you there! 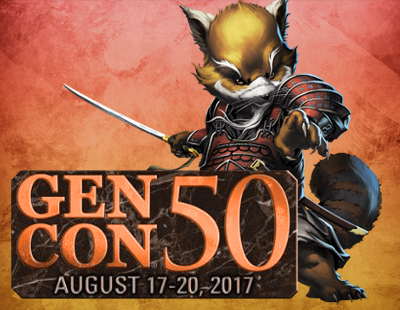 GenCon is being held at the Indianapolis Convention Center in Indiana from August 17th - August 20th. 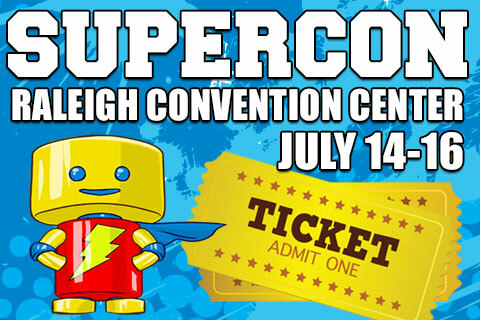 Flurry the Bear and I Skye will be at Raleigh Supercon this weekend! The convention goes from Friday, July 14th to Sunday, July 16th. I will be signing books and have a plethora of cool stuff for fans. All of my prices for the convention are discounted. Instead of $24.99, the plush bears will be only $15! Books are $10 and eBooks are $2. I will have special combo deals and freebies, too! Stop by and get the latest in the novel series, The Assassin's Pact. I hope to see everyone there! For more information and tickets, click the Supercon image below. A Prize Drawing & More! It's time for a big announcement! Where to begin? Well, first of all, I apologize for the lack of news updates. Nothing is wrong, and Flurry didn't go away. I've been hard at work making MANY things that I hope to unveil this year. Doing a large bulk of the work alone makes it slow-going. I'm wearing too many hats, but we all have to do what's needed to make things work out. It's a good thing that I'm passionate about my books and love every bit of it! The great news is that I have BRAND NEW books! The cover art, logo, and interior text has been revised and it's the best looking stuff I've ever had! As of June 1st, I have new eBooks made for Amazon Kindle with Nook and other eBook versions in the works. I'll announce when they're all ready. The website has been updated with new freebies. The characters page has brand new character art and character bios. The creatures and items pages also have had revisions and additions. Also, be sure to check out the brand new merchandise. There are posters, calendars, buttons, mugs, t-shirts, fleece blankets, pillows, playing cards, books, eBooks, plush bears, mouse pads, stationary, and much much more! Book 6 in Flurry's series has been published! The new book is named The Assassin's Pact. The story follows Flurry and his friends as they attempt to make their way home. It takes place two to three months after the events of The Rising Tide. If you remember Isangrim and Necatual from the epilogue of The Land of the Sourpie, then this is where you will find out more about their alliance and what that means for Flurry and his friends. 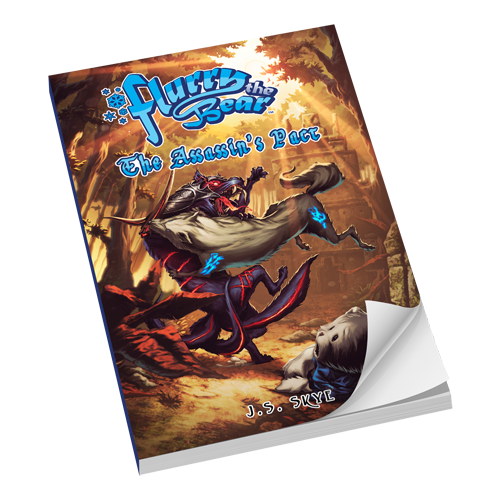 To start this month off to a great start, I'm offering 5 copies of The Assassin's Pact for FREE! It's an Amazon giveaway. The requirements are that you be 18 years of age or older, living in the United States, and have an Amazon and Twitter account. Other than that, it costs you nothing at all! You can see the complete rules at the link below. Just click on the image of the book and it will take you to Amazon. The drawing will end on June 8th and there will be 5 lucky winners of my newest book! If that wasn't enough, I have even MORE free stuff for you! Are you on Flurry the Bear's mailing list? No? Why not? Don't you know that's where you're going to get information and freebies before anyone else? Sign up on the form down below, on my author page, or on the main home page for this website. By joining the mailing list you will get an entire eBook for FREE! That's right, more free stuff! The book is available for Amazon Kindle and in PDF form. Need it for Nook or another eBook reader? No worries! That's being prepared and when it's ready, everyone on the mailing list will be given a link to it, too. What are you waiting for? Sign up today!